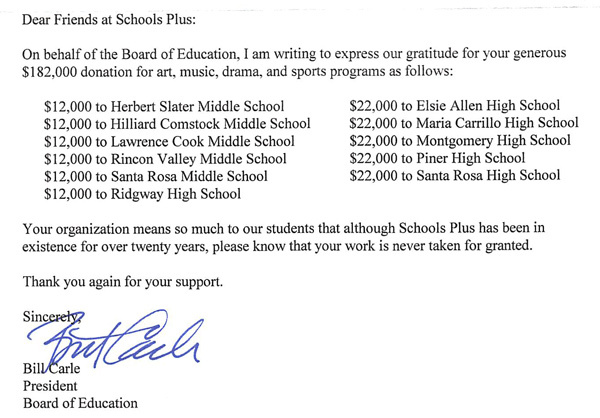 For the twenty-eighth consecutive year, Schools Plus has allocated $150,000 to Santa Rosa’s public secondary schools. 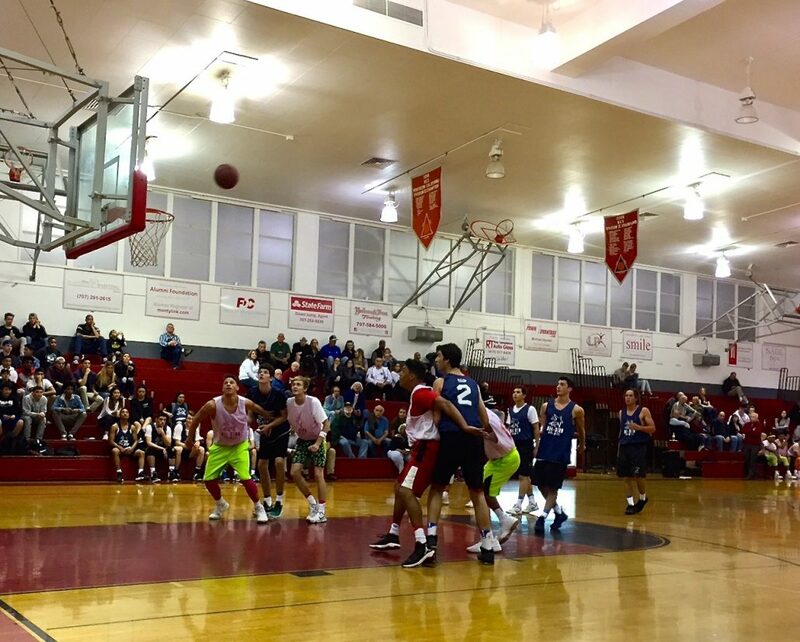 The sixth annual Schools Plus Senior All-Star Basketball games drew the largest crowd ever. Players, coaches, parents and all spectators enjoyed two hard played, thrilling games. 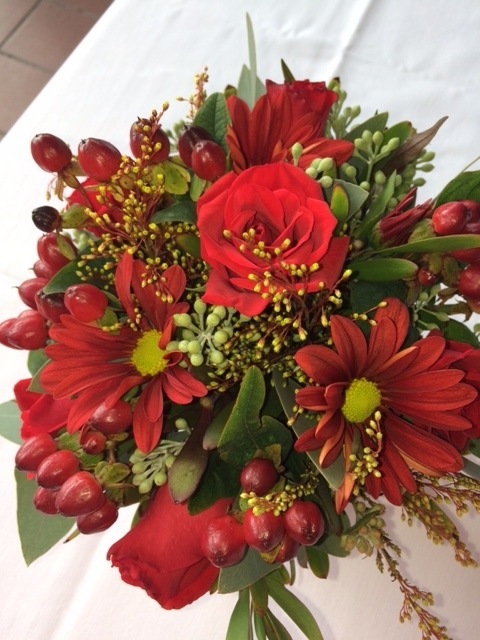 The 2017 results: The Girl’s game was won this year by the SCL – 54 – 51. The boy’s game was won by the NBL 84 – 79. Our 2017 allocations total $150,000 to be distributed amongst the eleven SRCS secondary schools that Schools Plus has supported for twenty-seven years. 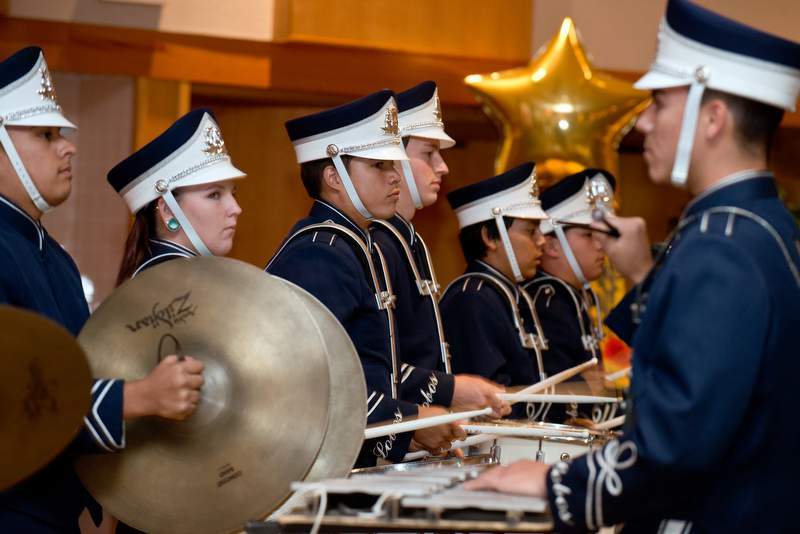 The five senior high schools will each receive $20,000 to be divided equally for athletics and The Arts. 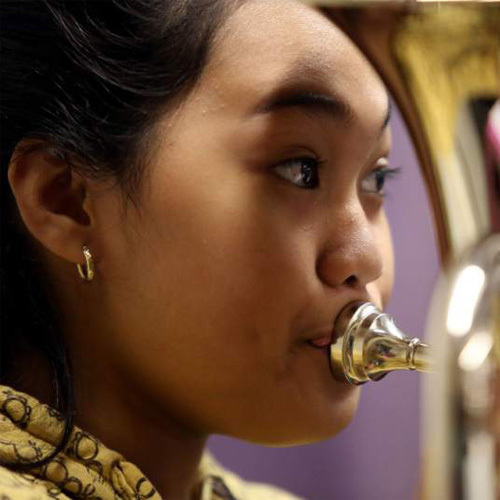 The five middle schools will each receive $8,300 for sports and The Arts. 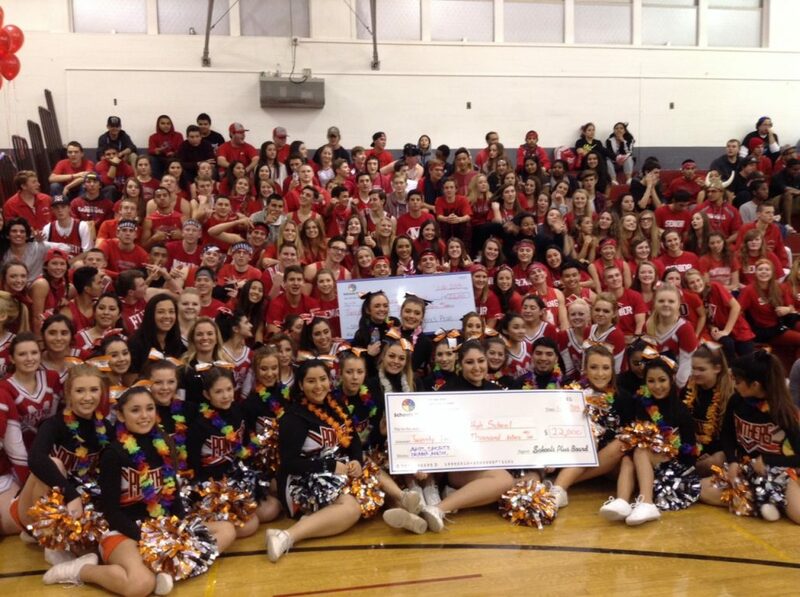 Ridgeway High will also receive $8,300. 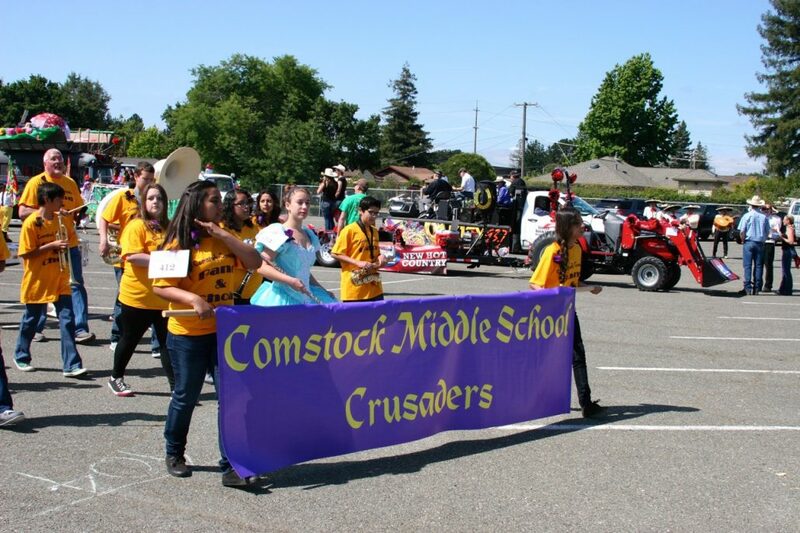 Since 2010, the current Schools Plus board, with the generous support of the community, has raised $900,000 for Santa Rosa’s public school students. 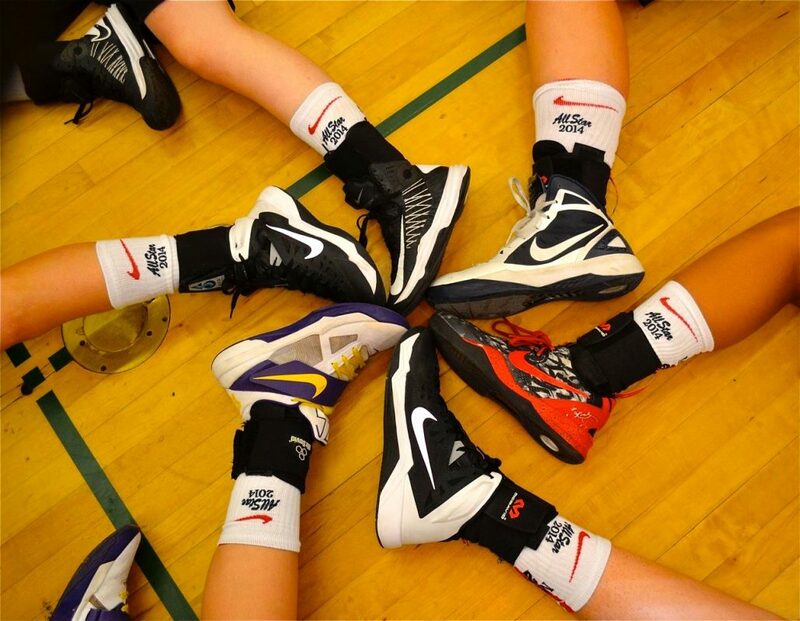 for providing cool, Nike socks for all of the high school seniors playing in the Annual Schools Plus High School All-Star Basketball game. 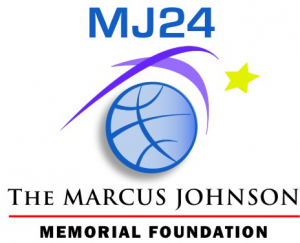 The Marcus Johnson Foundation has donated the socks for four years. 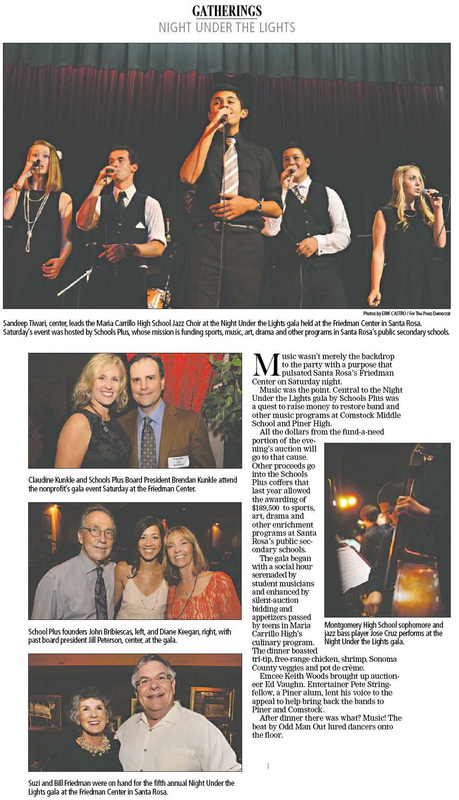 The games feature the NBL vs the SCL. There’s a girls’ game and a boys’ game. 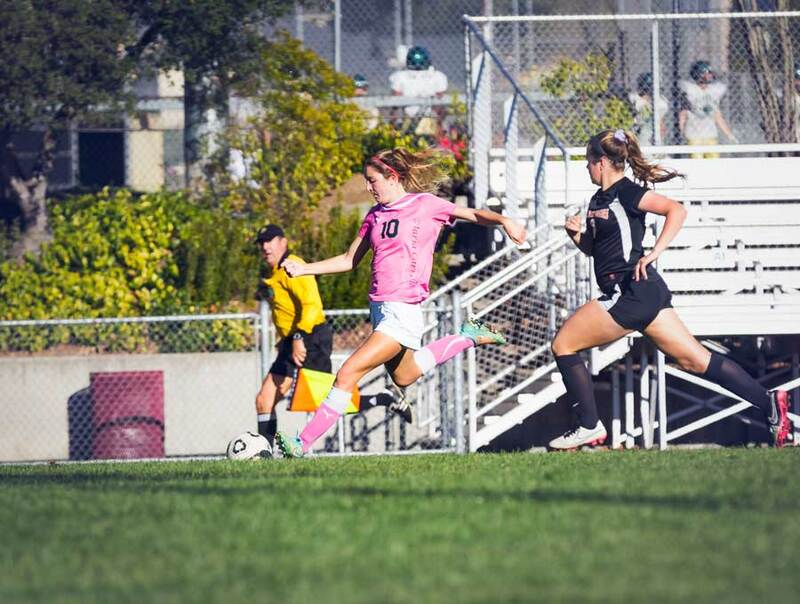 The Puma Girls have been perennially ranked as a top team nationwide. 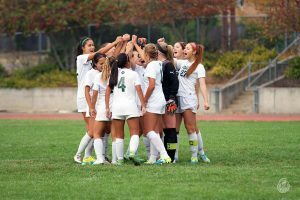 Each season the teams travel for preseason matches, league matches, and post season play. 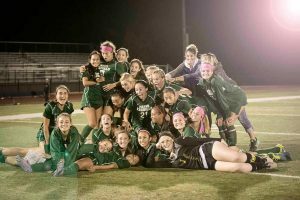 The 2015-2016 team has once again won the league and North Coast Section championships. Such a winning schedule requires a lot of travel that adds up to thousands of dollars each season. Likewise, all of the games require paid officials, another big bite out of athletic budgets. 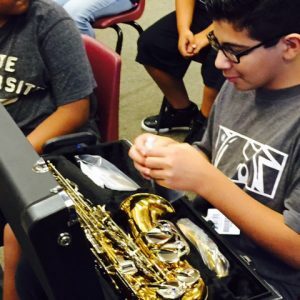 Fall semester 2015: New Comstock Middle School music students open the cases of brand new instruments provided by Schools Plus made possible through the support of our donors. 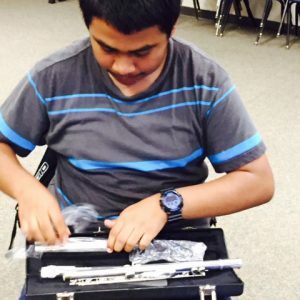 The new class has 16 students enrolled, 10 who have no prior music instruction. 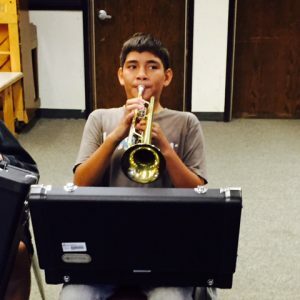 They’re beginning the journey of a life time. 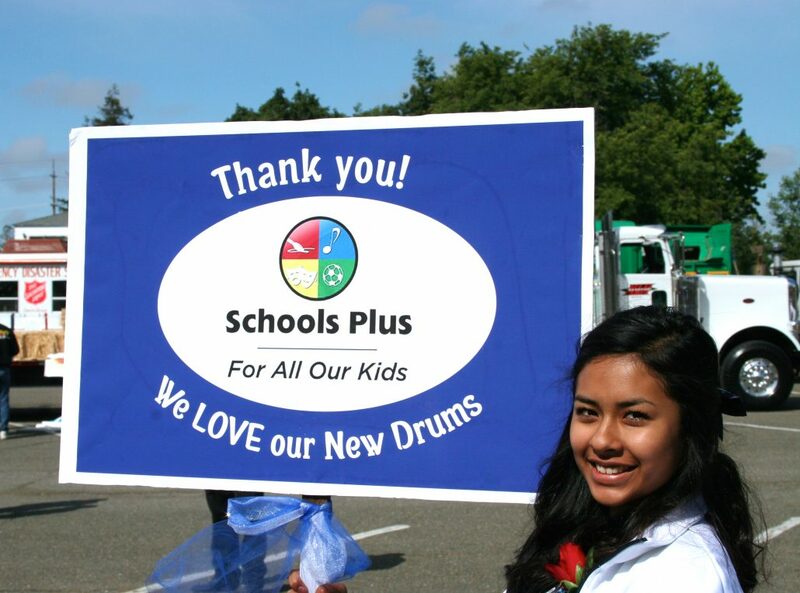 Schools Plus Makes it Possible for Comstock to March in Rose Parade! 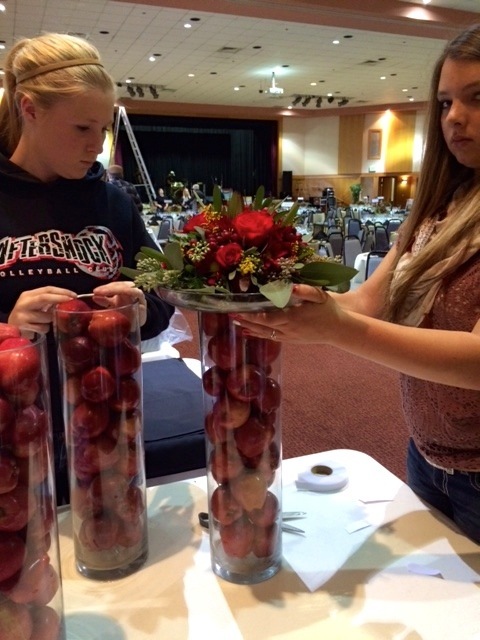 The SRHS Floral Program students helped prepare table center pieces for the 2014 Night Under the Lights! 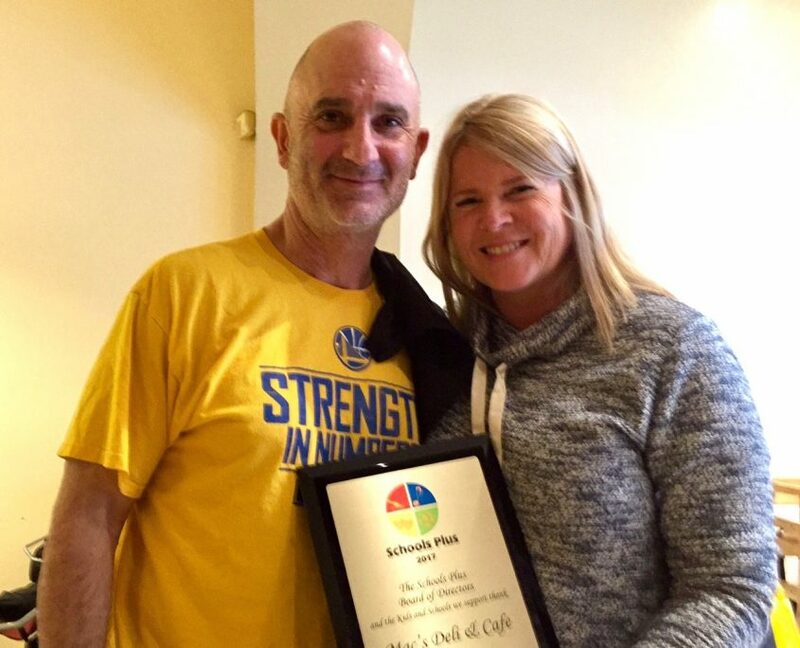 Elsie Allen & Piner, and Montgomery & SRHS, both were presented Early 2015 Allocations Checks of $22,000 at basketball halftime! 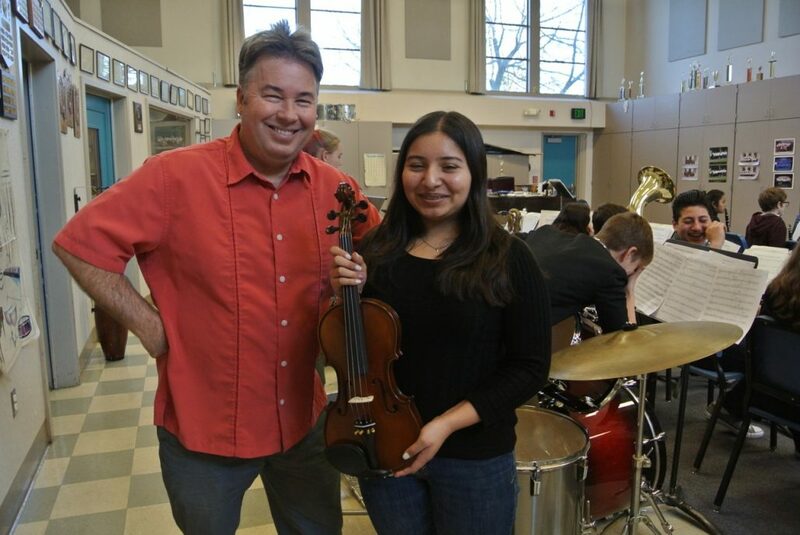 Generous Schools Plus donor donates Violin, enabling students to bring their instruments home! 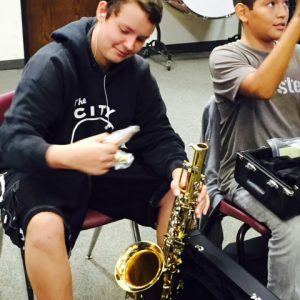 “I’m writing about the disparities that harm students in Santa Rosa’s schools and the ways in which Schools Plus works to address them.